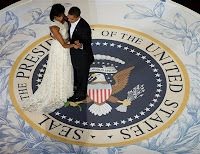 I am a little late to the show with a post-inauguration blog, so instead of trying to craft a brilliant essay about this wonderful, wonderful moment in time like you might find here or here (I haven't the skill), or summarize a day you have all read about 80,000 times, which I regretfully did not attend, I think I will just highlight my favorite moments. • I relished how diverse the audience was. It was very moving to see something happen in this country, that all of its citizens could feel a part of. I can't imagine the sense of pride that African Americans must have felt, particularly the Tuskegee Airmen, and those that worked for Civil Rights. At one point during Obama's speech, I saw John Lewis slowly shake his head; no doubt still disbelieving that this great day had come. • I like Michelle's clothes. In fact I like Michelle. And Sasha and Malia are adorable. A friend of mine recently said, "I have a little bit of a huge crush on the whole family." Yep. • I was angry that Rick Warren was asked to do the invocation. I thought it was a kick in the teeth to the gay community and their straight allies, particularly after Prop 8 passed. The fact that neither Obama, Hillary Clinton or John McCain would openly support gay marriage is such a disappointment to me, particularly given all the barriers that were broken in this historic election cycle. All of this has been gone over a thousand times, I know. But I think it can be said one more time that there is no reason to reach a hand across the aisle to bigots. Rick Warren isn't going to change and neither are his followers. • I'm not a religious person at all, but Rev. Joseph Lowery's speech moved me. This in particular: "Help us then, now, Lord, to work for that day when nation shall not lift up sword against nation, when tanks will be beaten into tractors, when every man and every woman shall sit under his or her own vine and fig tree, and none shall be afraid; when justice will roll down like waters and righteousness as a mighty stream." • I loved the sight of W's airplane leaving for Texas. I really, really did. I appreciate how gracious he has been during this transition, and the speech he gave when he landed in Midland was pretty cute. He's funny. A lot of torture and misery might have been avoided, if he had been the wisecracking baseball commissioner instead of President. • This: "Now, there are some who question the scale of our ambitions — who suggest that our system cannot tolerate too many big plans. Their memories are short. For they have forgotten what this country has already done; what free men and women can achieve when imagination is joined to common purpose, and necessity to courage." And this: "As for our common defense, we reject as false the choice between our safety and our ideals. Our founding fathers, faced with perils that we can scarcely imagine, drafted a charter to assure the rule of law and the rights of man, a charter expanded by the blood of generations. Those ideals still light the world, and we will not give them up for expediency's sake." Obama wrote in Dreams from My Father of the impact that The Autobiography of Malcolm X had on him, noting Malcolm's many transformations "forged through sheer force of will." I know that there are many that don't admire Obama or believe that he can do much of what he claims. I know they think that we Obamaniacs are in for a rude-awakening and I realize there will be disappointments, but I also know that our country has been transformed, through the sheer force of will of the people. Peacefully, and against the odds. As Obama often says, "how about that?" In blogging news, Gossip Girl was a repeat this week, but still to come: My top of the top TV list, and a Product Review. Look at me rockin' my resolutions!? Woot woot. oooooooooooooooooooooo aaaaaaaaaaaaaaaaaaaaa a commment box! nice work my friend...keep blogging the blogosphere! Thanks for the reminding me of the deeply moving words spoken by Rev.Lowery.